Is it possible to use the Controller bar in Cantabile to send MIDI CCs to external devices? I’ve found where I can create a binding in a background rack to receive a CC from the Controller Bar and then send another CC out from that, but that seems somewhat redundant. Even using triggers from buttons on the controller bar to send to the background rack would be a cleaner approach. Hi Juergen. Yep, I’m aware that the controller bar sends MIDI to Cantabile via the onscreen keyboard. What I want to do is use the controller bar to send MIDI to external devices (via an Out port instead of an In port). In this instance, I want to use the controller bar to send CC10 out to an external MIDI device on channel 2. Oh!! Hahaha, I get what you’re saying now. I’ve got three MIDI ports in Cantabile. 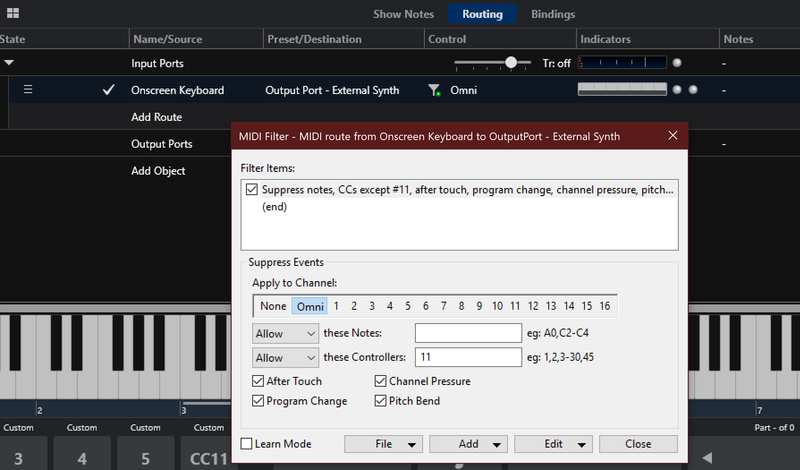 When I add Onscreen Keyboard as an assignment for Out: LoopMIDI, the CC event from the button still only shows up on the In: XR18 port. This will send controller 11 data created by a slider on the controller bar to whatever is connected to “External Synth”. BTW: I’d recommend to NOT name Cantabile’s logical MIDI ports after the actual hardware connected to them, but give them more “abstract” names. Makes things less confusing when you change out the hardware. So it’s better to call input ports “Main Keyboard” or “Upper Keyboard” instead of “XR18” - you may change your controller some time in the future and don’t want to have to change all your song files. Thank you gentlemen, that’s got it sorted. I’ve now set up the XR18 with generic audio and midi ports and edited all the songs in our current playlist. I will now slowly but gradually work through the rest of my songs to make them “compatible” with the new, generic naming system (which are only about 100…). And of course, I will have to rename the ports for my existing 18i8 configuration. By the way, the Verify Setlist option has been great help to make sure I didn’t forget some binding in a rack or something. I’ve now set up the XR18 with generic audio and midi ports and edited all the songs in our current playlist. I will now slowly but gradually work through the rest of my songs to make them “compatible” with the new, generic naming system (which are only about 100…). And of course, I will have to rename the ports for my existing 18i8 configuration. One really clever feature of Cantabile is that you can rename a port, but add the old name as an alternative name in the “Aliases” field. That means when you load a song that refers to a port with the old name, Cantabile recognises it and converts automatically to the new name when you resave the song. So you don’t need to go through all your songs, manually fixing stuff up. That’s certainly a useful feature. However, it does not seem to work for MIDI ports on de Bindings tab (it works fine on the Routing tab). It just says “(missing target)” so I still have to manually select the target from the dropdown list. It seems to beat the idea of being able to share song files across multiple configurations. @Neil_Durant: One really clever feature of Cantabile is that you can rename a port, but add the old name as an alternative name in the “Aliases” field. However, it does not seem to work for MIDI ports on de Bindings tab (it works fine on the Routing tab). I think this may be a bug, or else I’m missing something obvious (as usual). @brad? I think it sounds like a bug too - I can’t see any reason why you’d want to exclude bindings references to ports from the alias mechanism.